I hunt caribou in my exclusive 795,000 acre guide use area (25A) located in the heart of the Arctic National Wildlife Refuge. I have been doing this professionally in the Brooks Range since 1994 and have an intimate knowledge of the animals and the country we will be hunting. My pilot flies a Cessna 185 out of the small Athabascan village of Fort Yukon which is typically about 1 1/2 hours flight time from my hunting camp and should give you some idea of how remote this area is. This bush flight, in and out, is included in the price of the trip. We will establish a base camp at the edge of a landing strip and fairly close to a water source. It will consist of a roomy dome tent or screen canopy that will serve double duty as a kitchen and storage area, and smaller domes will be utilized for sleeping. Because of weight restrictions and the limited space available on the plane, food is primarily high quality freeze-dried meals or other one dish mains prepared with boiled water. This is supplemented with various high energy snacks and more traditional items from time to time. I put a lot of thought and devote a good deal of effort to make this entirely satisfactory and clients have been very complimentary in the past. A typical day begins with plenty of hot coffee and a simple breakfast. After packing a lunch and snack pack, we’ll make our way to one of the numerous vantage points that ideally gives us a near panoramic view of a particular valley. This is where you’ll likely see singles, pairs, small groups or herds of caribou moving through the country or feeding and resting in the surrounding area. If a particular bull suits us, a stalk will be executed based on our overall chances for success. This is determined by many factors including distance, time of day, wind direction, etc. We will continue these daily treks throughout these 8 day adventures but will always return to the main camp for a hot evening meal and the comfort of our sleeping bags. 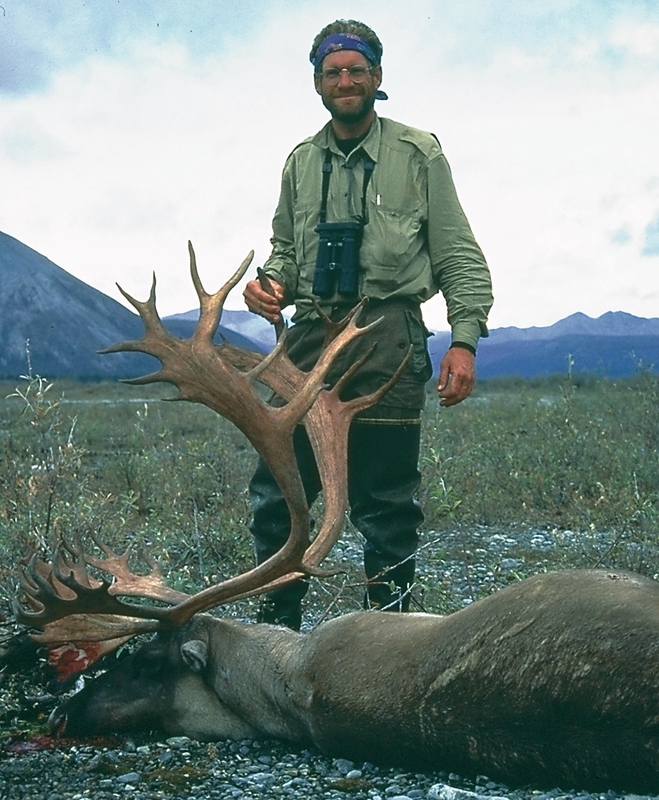 Generally speaking, I consider caribou hunting fairly easy from a physical stand point but the Arctic demands that you are a healthy weight and in excellent shape with top gear. Patience and mental toughness is essential and clients are expected to participate fully in the hunt. The caribou we will be hunting comprise the Arctic’s Porcupine herd which, according to recent surveys, is some 230,000 animals strong and continuing to increase! It is the most viable in the state and wildlife managers are very encouraged that this upward trend is here to stay for awhile. The average bull in August, up until the end of the month, will likely have a slight white mane and antlers covered in dark brown velvet. Toward the end of the month and certainly into early September, this velvet is shed and the mane continues to be more pronounced. By mid month, mature bulls sport great white beards and impressive dark racks. Trophy criteria is often his overall configuration and “how he will look on your wall” rather than a specific “score”. Caribou can be encountered in my area anytime of the year but are offered specifically on 8 day hunts August 30 - September 6 and September 6 - September 13. Arrangements are either 2x1 or 3x1 with both approaches being quite reasonable due to the numbers we are likely to look over.